The food was good but I wasn't a fan of standing around in the sticky mess made by people pouring sauce into their bowls. I also did not enjoy people breathing down my back while standing a packed line waiting to get my food cooked. Probably would have gone up for more food if I hadn't disliked the whole process. The atmosphere was very bland. 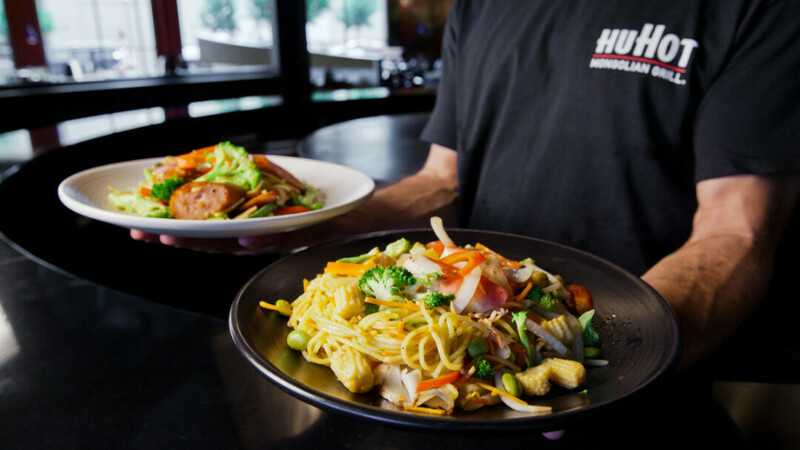 With a name like "HuHot Mongolian Grill" I expected a more Eastern atmosphere and music, not Glee cover songs, plastic bowls, paper place mats, and plastic Pepsi glasses. Most of this is personal preference rather than truly poor restaurant quality, but I won't likely be going back. Great place! Amazingly fresh food and a fun and entertaining environment. AFter all of the hype about this place, my wife and I finally went there a couple of weeks after it opened. After waiting in line to get my name on a list to wait some more, we finally were seated after about 20 minutes. We ordered two sodas and a potsticker appetizer and then proceeded to the buffet. There was a huge backed-up line to the very end. We painstakingly made our way through the buffet carefully selecting and piling our noodles, meat and veggies in one of their not-so-big bowls. Mine was heaping because I didn't want to have to come back and wait another half-hour to go through the line again! We made it to the "sauce bar" which was strewn with other people's meat and veggie selections that had fallen off into the sauce containers. The salad bar style sauce buffet was difficult to manage due to the low sneeze guard and long-handled ladels in the sauce pots. It made the sauce area and floor around it super sticky and gross. The grill area wasn't much better. The cooks at the grill were flinging food around the grilll at a chaotic rate. It made it seem messy and somewhat unsanitary due to all of the sweat beading off them from working the hot grill all day. Plus, you really had to keep track of which dish was yours since it could have easily gotten switched with someone elses. I had carefully topped my heaping bowl with a large carrot disc, which somehow got misplaced on the grill. Anyway, after receiving our hot bowls of mongolian goodness, we went back to our table to find our watery sodas and luke-warm potstickers waiting for us. Overall, the place is fairly pricey eventhough we went during lunch. Not worth the hype in my opinion.